Ever gone looking for something in your shed but it’s too dark or shadowy? Reached for a flashlight but the batteries are dead, or it’s not there? If you store fuel or chemicals in your shed, don’t flick your Bic or strike that match or it may be an enlightening experience! Shed lighting is a great solution to a common problem. It can be frustrating to try and find something in a dark shed when you’re standing in the open doorway relying on light filtering around you. Luckily, there are some great options for lighting up your shed! You can use natural light by installing a window, skylight or sun tube to brighten the interior during daylight hours. Alternatively, artificial lighting using solar power, a generator, or electricity are other possible solutions. In this article, I’ll show you both natural and artificial lighting options and explain how they work. I’ll discuss some pros and cons of different products, information on installation, and generally how you can improve your shed lighting. What are the Lighting Options for Your Shed? There are two options available to light up your shed, natural and artificial. Natural light is provided by the sun while artificial relies on some type of energy being used to produce light. Natural lighting options allow the sun’s light to enter your shed through openings in the walls, roof or doors of your shed. Windows, skylights and sun tubes are the more common ways to bring natural lighting into a shed. The brightening of the interior is determined by the strength of sunlight entering; time of day, clouds, and season all affect the quantity and quality of light. Artificial lighting options rely on an energy source to provide on-demand-lighting when and where you want it inside or outside your shed. Solar, wind, electrical and generators are the common sources to provide energy for lighting in a building. As long as the power source is working, your lights are able to work. There are many factors to consider when choosing a lighting option for your shed. How much time you plan to spend inside your shed, its size and location, how much lighting you need, for how long and how often, and safety and durability are all factors to consider. The final consideration is your budget. The more time you plan to spend in your shed, the greater the need for lighting. If you only go into your shed for a couple of minutes once or twice a month and never at night, justifying the time and expense may be difficult. If your outbuilding is located under a canopy of trees and only gets filtered sunlight, then natural lighting options may not work well. If it’s in a treeless location and south or west facing, then natural may be the way to go. Living in a 4-season location will also impact lighting needs. A small utility shed that reveals its contents completely when you open the door is less likely to need a lighting solution than a larger structure. The amount of lighting you need, for how long and how often may limit your options. Natural light can create shadows, which make finding things in your shed difficult.It also won’t provide much illumination for night-time use. If your shed is also your workshop or man cave, then artificial lighting may be the solution. Your man cave or workshop may require lighting over tables or equipment, which may need better lighting. However, a hanging light above the door or in the middle of a storage shed may adequate. If you decide on artificial lighting, then you need to determine the type of electricity that will work best for you. Your options are solar, wind, 12v, 110v, or 240v. Each provides a range of choices for your consideration.Some options are safer and more durable for use in sheds. I don’t advocate open flame in a shed for safety reasons – I learned how volatile aviation fuel could be by watching someone who should have known better.However, bringing electricity to your shed could prove dangerous too. Know your strengths and weaknesses and get assistance where needed. Some solar options are more durable than others are, but temperature extremes can be hard on plastics. If the ceiling is low, a light protected by a cage may be a good idea too. The final consideration is the budget. How much you’re willing to spend lighting up your shed determines much of your solution. An alternative to lighting may be to paint the inside of your shed a white or light pastel color. The paint reflects 60 to 70 percent of the available light and improves light efficiency. It may be a good idea even if you do install natural or artificial lighting. The sun is the original bright idea when it comes to lighting up a building. Getting the sun’s light into your shed is what this section addresses. Determining the amount of natural light available to your shed is fairly easy. Walls that are oriented south or west are ideal for providing direct sunlight into your shed through windows and doors. A roof with a gable oriented north-south will also provide sunlight through skylights or sun tubes. If your structure is under trees though, you may have to remove some branches or trees to improve light penetration. The following are options to get natural light into your shed. A shed style roof has a single slope due to one wall being higher than the opposite wall. The tall wall is ideal for installing windows close to the eves to allow sunlight to stream in. The upper windows illuminate the shed and still provide privacy and security of the contents. You also don’t lose valuable wall space to windows. However, there is the potential for increased heat from the solar gain. 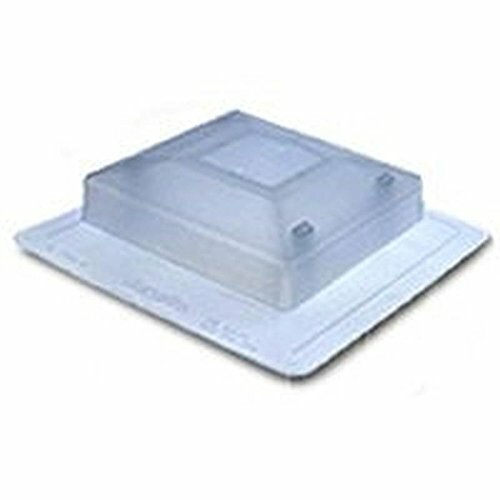 Skylights are one way to bring sunlight into a building through the roof. There is a variety of choices available for existing or new sheds. Choose the size, style, and material that best suits your shed and needs. They can be similar to those used in homes with a glass or plastic “window,” or more like those in camper trailers that are opaque box-like structures. Many skylights are designed to open, and some trailer styles are always open, so they not only bring light into your shed but also vent heat out. You can pick the Duraflo 5975C ShedLight up on Amazon. The solar or sun tubes are another way to bring light through the roof into your shed. They are a flanged galvanized metal cylinder or container with a bubble top. The bubble top allows sunlight from all directions to enter the tube while a lens at the ceiling end disperses it. The tube has a reflective mirror-like finish, which amplifies the sunlight and illuminates the inside of the shed. To be most effective the sun tube should be placed close to the ridge so the Bubble can gather sunlight from all directions. Select the tube appropriate for your roof. Some are manufactured for steel roofing, some for shingle, and some for both. Determine where the opening is to be centered and drill a hole up through the roof. Push a marker into the hole so you can find the hole when standing on the roof. Most skylights and sun tubes come with a template, but some don’t; make one out of boxboard if needed. Trace the skylight opening, not the flange! Use a saw appropriate for the job and cut out the hole – I use a cordless reciprocating saw. Most skylights or sun tubes have a flange that slides under the shingles or steel and needs to be caulked. Slide the flange under the shingles or steel above the hole; it should sit on the shingles or steel below the hole. Caulk and secure to the roof. You can purchase LIGHTblaster Solar Tube Skylight on Amazon. Windows are one of the most common ways to bring sunlight into your shed. They come in metal, plastic, or wooden frames and a variety of sizes and colors. Some have safety glass; others plate glass or plastic. Some open, others don’t. Most have screens for ventilation and can be latched from the inside for security. Windows on the south or west facing walls also bring in the most light. The awesome part is how easy they can be installed into or onto a shed. A flush mount shed window, or single hung aluminum mobile home, or storm window can be installed fairly quickly. Most are sized to fit between the studs so don’t require any framing. Identify where you want the window, trying to locate it between studs. Move any items that are in the way. Drill a hole from the inside out to mark an upper corner and then push something through the hole so you can find it easier when outside. Use the supplied template, or make your own for the window only, not the flange. Make sure your template is level horizontally and vertically. Use a saw, I like my cordless reciprocating saw and cut out the shape. Some come with a waterproof tape seal for around the hole – I’d still use it and caulking around the hole too. Hold the window in place and use the supplied or correctly sized screws, and attach it to the wall. Wipe off any excess caulk, and your window is installed. For wall insert windows the installation is the same, except you may need to add a top and sill plate between the studs. 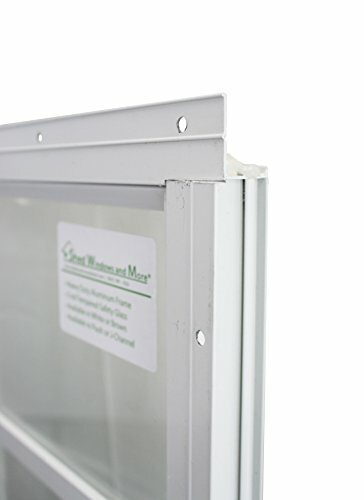 Usually, you can shim the sides and screw the window level and secure to the studs. Remember to caulk the seams and around the frame and flange. For windows near the eves or on the high wall of a Skillion style roof, try using plexiglass and make your own windows. They can be framed between the studs, or run over the studs and framed and caulked to keep water out. Note: Pre-drill the plexiglass slightly larger than the screws to prevent cracking or breakage. 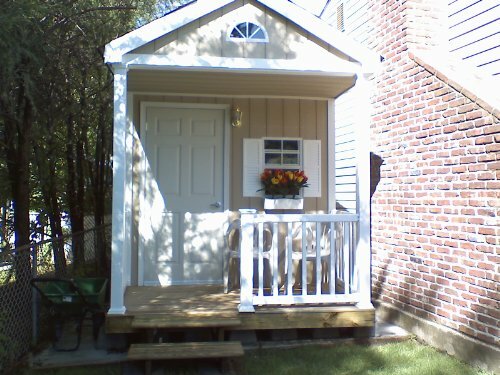 You can order White Flush Mount 14″ X 21″ Shed Windows on Amazon. A shed cupola with windows is a great way to bring light into a shed with a non-lean-to style roof. The cupola straddles the middle of the ridge and allows sunlight to enter into the shed from all directions. They can be constructed of wood, metal, or plastic and come in different sizes and colors. The windows can be glass or plastic, and the cupola may even be vented to help heat escape. 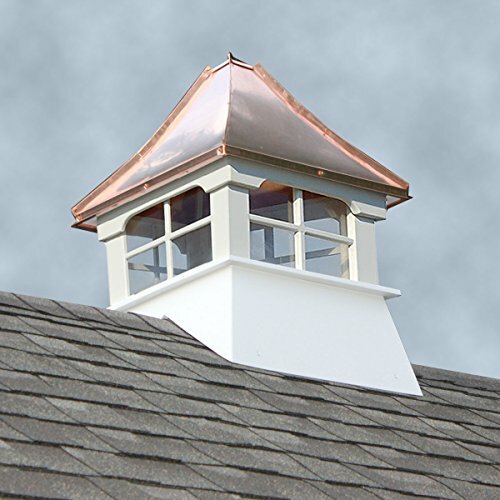 The cupola may have a matching finish to your roof or a classic copper finish. Some even are topped with a working weather vane. Most purchased cupola kits come in 3 pieces – bottom, middle, and roof cap – and need minor assembly; and often have good instructions. However, the bottom is usually finished flat and needs a triangle cut from two sides to fit the slope of your roof where it straddles the ridge. Determine where you want the cupola located on the ridgeline. Follow the instructions and use the template, or make a template, and remove the shingles or steel from the area. Use a saw to cut out the hole; it should be smaller than the base of the cupola. Make sure you do not cut any structural supports like a rafter or ridge beam. Cut the base of the cupola to match the slope of your roof. Secure the base to the roof, use caulking to seal the joints, and assemble the cupola. You now have light streaming into your shed. You can pick the Accentua Rainier Cupola up on Amazon. Artificial light is a great way to illuminate your shed. It can go where you need it most to improve the quantity and quality of light. Natural light is limited to the angle and brightness of the sun, and sometimes the moon. Artificial light is on demand 24 hours of the day when you need it. Lifespan is how long a light source will last and depends on the type of light source used. How frequently and for how long it is on also affects lifespan, as does humidity and temperature. Energy efficiency is using less electricity to provide a similar amount of light to illuminate an area. It means conserving energy and reducing pollutants used to produce electricity. How easy it is to install a light source is an important criterion. Do you need to install a couple of screws to hang something up, or install a full power source to provide electricity? Another consideration is how easy it is to replace a light source. Color temperature is how cool or warm a light is to our eyes. It is measured on the Kelvin (K) scale with a color associated with temperature; the higher the temperature, the colder the color. A bluer light will seem colder and brighter while a white or orange tinge will feel warmer and less bright. An incandescent bulb is a vacuum tube with a filament that requires a lot of energy to produce light. A CFL, or Compact Fluorescent Lamp, is filled with a gas that requires a fifth of the energy to make it glow to produce light. The LED, or Light Emitting Diode, requires 40% less energy than a CFL to produce light. The more energy used, the more heat produced; so incandescent bulbs produce a lot of heat, and LEDs very little. They also all have different lifespan ratings. LEDs usually have the longest life and incandescent have the shortest, with CFL falling in between. The LED may cost more initially, but will last longer and use less energy. Wattage is a measurement of the amount of electricity a light source uses. Lumens are a measurement unit for visible light, the more lumens, the brighter the light. Incandescent bulbs were rated by the number of watts needed to produce light; the higher wattage meant a brighter light. However, CFLs and LEDs produce the same amount of light, or lumens, but use significantly less wattage to do so. When purchasing lighting remember that the lower the wattage, the less energy required. Also, the higher the lumens, the brighter the light. A 60-watt bulb may produce 650 lumens, while a 13-watt CFL or 7-watt LED can provide the same amount of lumens. When selecting a light for your shed look at the watts for the amount of energy it uses, check out the lumens for the brightness, and then look for the lux. Lux is the measurement of illumination by 1 lumen in 1 square yard (9sqft). So a 10’ x 10’ shed is 100 sq ft = 11 sq yds. It’s recommended that a reading area have a minimum of 300 lux, multiply that by the 11 sq yds and you get the number of lumens required to light the area reading bright (300 x 11 = 3300 lumens). Keep this in mind when selecting lighting for your shed. Solar powered shed lights are designed for sheds and use the sun’s energy to produce power. They use a small solar panel to collect the sun’s energy, which is stored in rechargeable batteries, so it is available after the sun has set. Most will operate for 6 to 8 hours without recharging if the batteries are fully charged, and they reload when the sun is up. If you have a shed that has a darkened or shadowed interior that makes it difficult to locate what you want, or if you want to improve outdoor security and light up the approach to your shed, then solar shed lighting may be what you want. Remember, for the sun to recharge the batteries for the solar light the solar panel needs to have exposure to the sun. Also, check the lumen count – 30 lumens isn’t very bright. An integrated solar panel is a waterproof unit constructed of aluminum or durable ABS plastic. They usually have powerful LED lights, which produce 800 lumens, or more, rechargeable lithium batteries and a controller, and a solar cell array all combined into a single unit. Many can detect motion 20 – 26 feet away and at 120-degrees to the unit. Most have an illumination range of 180 – 270-degrees. All come with warranties, some are a very generous 18 month! The integrated unit is easy to install and often includes screws and adhesive strips. The unit can be mounted on the side of a shed, above the door, or on a post to illuminate for security or access purposes. They usually have time (5 – 180secs), brightness, and sensitivity settings which can be adjusted for individual preferences. Note: longer it’s on, the brighter it is, and the higher the sensitivity, the more you drain your battery. 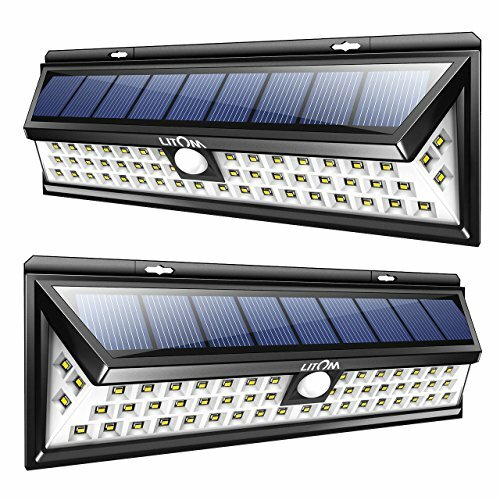 To check the price of the Litom Bright 54 LED Solar Power Lights on Amazon, click here. 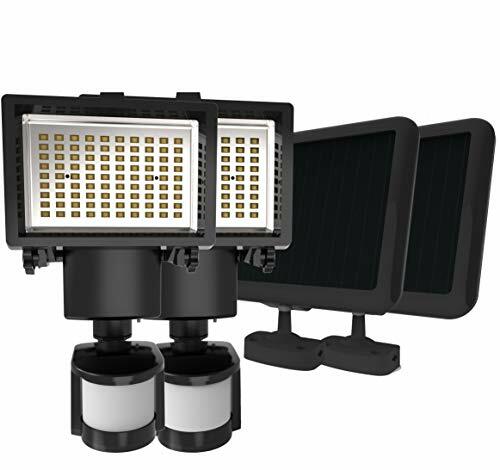 The separate light and solar panel kit is a plastic indoor-outdoor lighting package. It has a small solar panel linked by a 16-foot detachable cable to a 30 – 50 lumen LED light fixture. The energy is stored in long-life rechargeable batteries, so it is available when the sun has set and recharged when the sun is up. Most have a pull-string or can be set to a motion sensor; they also have a brightness setting. The solar panel can be mounted on an exterior wall, the roof, or on a post, so it receives full sunlight. The detachable cable can be run through a ¼” hole (or larger) in the shed wall and then connected to the light. Remember to caulk the hole after the cable is secured with the supplied brackets. 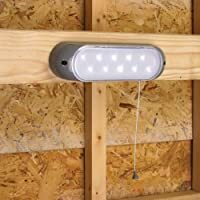 The light fixture can be mounted on the shed wall or ceiling using screws, or adhesive strips. Do not cut the excess cable! Coil and hang it out of the way. To check the current price of the ROXY-G2 Solar Lighting Kit on Amazon, click here. 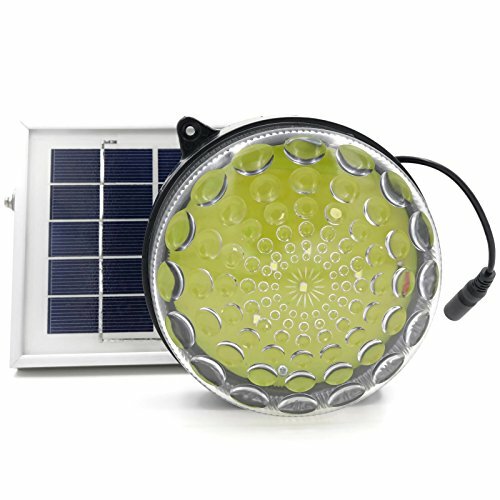 A solar lighting system with battery backup is a great way to supply lighting to your shed. 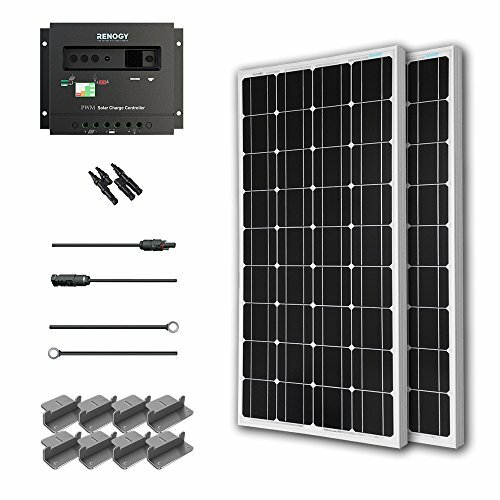 The system usually includes one or more solar panels, a charge controller, an adapter kit with cable, a tray cable, plus branch connectors and brackets for the number of panels in the package. Follow the instructions for assembling and purchase the recommended type of battery for storing the energy the panels produce. The charge controller can be upgraded to a unit that will handle two or more batteries. If the roof has a south-west facing slope with good sun exposure, you can mount the solar panels on the roof. Otherwise, you may need to place the panels in an area close to the shed that is better suited to maximize solar gain and use the mounting brackets to attach them to a post or frame, or both. Use LED lights, and you’ll have enough power for hours of light. Battery powered lights for sheds are very convenient and come in a variety of shapes and sizes. Some can look like a light switch, others like normal household fixtures with high-powered LEDs providing 300 lumens or more. They may have an on/off mechanism or be motion activated with a light sensor to prevent daytime activation. Most are plastic, but some do have metal components. All require standard size batteries. They are quick and easy to install using supplied screws, adhesive or magnetic strips. Remember to turn off when not in use. You can purchase Mr. Beams MB990 Battery Powered LED Ceiling Light on Amazon. 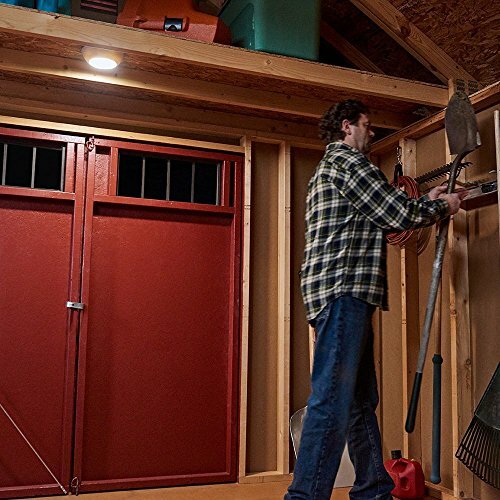 Electrically powered lights are another option for illuminating your shed. They work the same way your household lights do and can brighten a shadowed corner even on a sunny day. You can place them where you need them to light up work areas for repairing tools or building projects. If your shed doubles as your office or man cave, electric lighting may be a priority. Electric lights don’t fade or dim as the battery dies or the sun hides behind a cloud or sets. As long as you have electricity, you have light. A bonus to having electric power for lights is being able to recharge batteries for tools, or powering the all-important beverage fridge. Getting electricity to your shed depends on its distance from an existing electrical source on your property. A 100 foot 12/3 extension cord can handle 15 amps of electricity and power a table saw and enough LED lights to illuminate the darkest shed. Alternatively, you could run 110v to your shed from the house panel box, which means you don’t have to worry about someone unplugging the extension cord. A 15amp (or larger) circuit to a subpanel is a possibility. Check the electrical and building codes, so you are in compliance, you don’t want to negate your home insurance policy or cause an electrical fire. An ideal way to illuminate the inside or outside of your shed is using an LEDMO 50W LED flood light. It’s a powerful 250W halogen equivalent that projects between 4000 and 12,000 lumen 180 degrees while using only 50W to 150W. The heavy-duty aluminum lamp is water and dust proof and has a scratch resistant impact resistant glass lens plate to protect the LED projector. The 180-degree adjustable brackets allow for flexible mounting on walls, ceiling, ground or a pole. The flood lamps are not dimmable, and while some have a plug, others have to be hard wired. 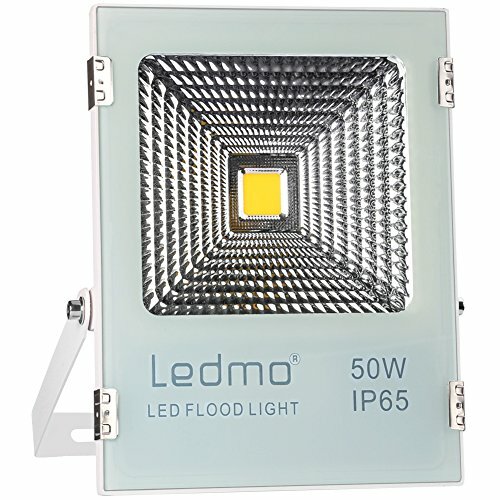 Click here to check the price of the LEDMO 50W LED Flood Lights on Amazon. Fluorescent lights are more energy efficient today and have a broader spectrum of color than LEDs. With higher light output than before, 20000 lumens or more, they are ideal for lighting up a workshop or fostering plant growth in a garden shed. The 4’ metal fixtures have a reflective inner coating, which projects up to 30% more light. Up to 5 fixtures can be linked together to light up even the largest shed. Installation is easy, screw the hooks into the ceiling, attach the brackets and chains to the fixture, hang and plug it in. Some have pull chains; others have a switch or two. The two switch products allow for dimming of the light by turning the inner 2 tubes on or off, and the other switch controls the outer 2 tubes. The fixtures can also be hardwired and mounted flush to walls if preferred. 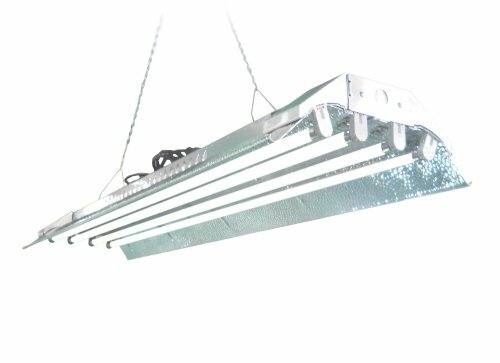 You can purchase DuroLux Fluorescent Fixture on Amazon. LED lights are a great way to provide inexpensive light to your shed or workshop. Many produce more than 2200 lumens while consuming only 20W. Constructed of aluminum and plastic, they are available in 4’ fluorescent like fixtures or projector style lamps. They can be mounted on walls, ceilings, under cabinets, or sit on a work surface. The 4’ models can be easily linked and controlled with one switch to create a seamless light band. Some of the lamp models are sealed units and can be used outdoors in inclement weather. 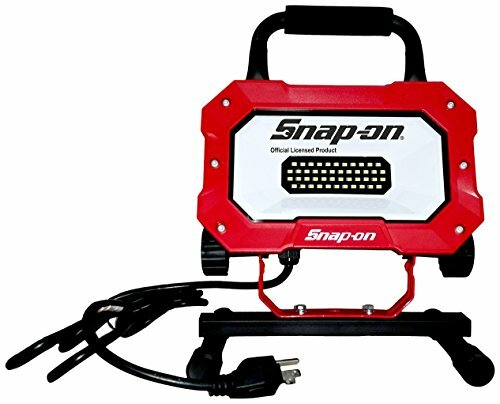 To check the current price of the Snap-on 922261 LED Work Light on Amazon, click here. LED strips are a fantastic way to illuminate different areas of your shed or workshop. Great for lighting under shelves, in cabinets, along baseboards, or decoratively around a beverage center in your man-cave. The strips can be cut to length with scissors, are connectable, dimmable, and very flexible. They usually come in 16’ lengths on spools and have 600 LEDs that produce 160+ lumens a foot. With the adhesive backing, they’re quick and easy to install. 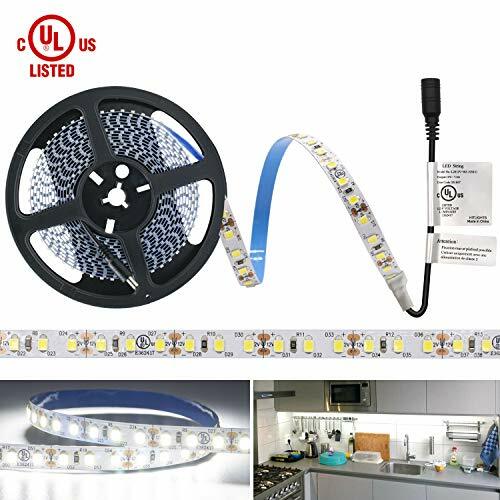 To check the price of the HitLights Cool White LED Light Strip on Amazon, click here. If you or your family members have a habit of forgetting to turn lights off, a timer switch may be a good idea. 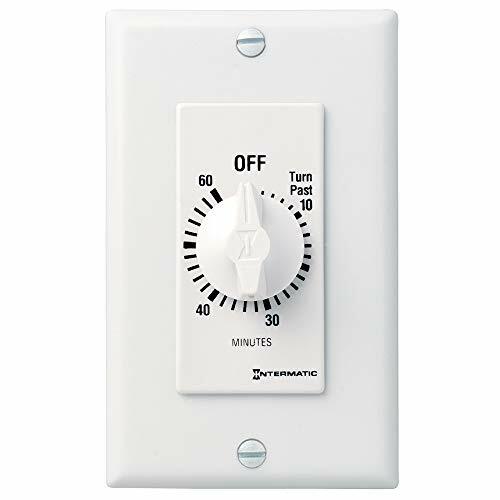 It is a spring-loaded mechanical timer that works with low voltage and fits into a standard light switch. It works on LED, fluorescent, CFL and incandescent lights. Some have a hold button that over-rides the timer but means you have to remember to switch it back to the timer mode. Solar powered security lights are durable and waterproof and can be mounted on a building or a post. They come in integrated models or a separate light and solar panel package. The panel collects energy from the sun during the daytime, stores it in lithium batteries, and lights up an area after dark when the motion detector is activated. The motion detector usually has a 120-degree range and can sense movement up to 30 feet away. Most have 3 or more sensing modes. The unit may also have a switch that allows it to be set in sensor mode or darkness mode for continuous light. The battery charge will last longer in the sensor mode. Some models also have low, medium or high settings for brightness. 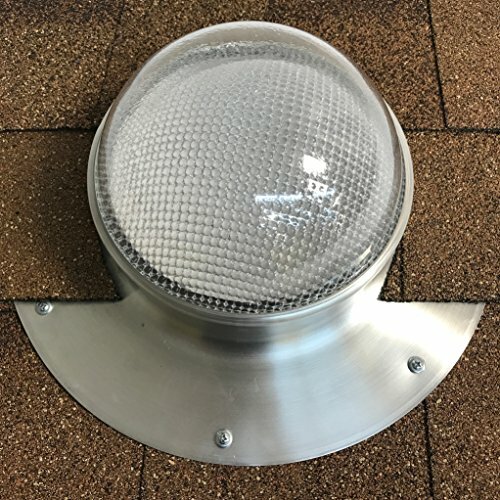 When selecting a security light for your home, garage, shed, yard or garden, remember to select a model that meets your needs. An integrated unit on a north wall won’t get enough sunlight to charge the batteries. However, a separate light mounted on a north wall can have its solar panel mounted elsewhere to get the sunlight. Check the number of LEDs and how many lumens it produces; the greater the number, the brighter the light. Review the angle of light spread, 90-degrees will light up a narrower area than a spread of 270-degrees, but be brighter. Determine if the unit has sensitivity adjustments for the motion detector, sensor and darkness modes, different brightness settings, and if you can change how long the light stays on. Do your research. 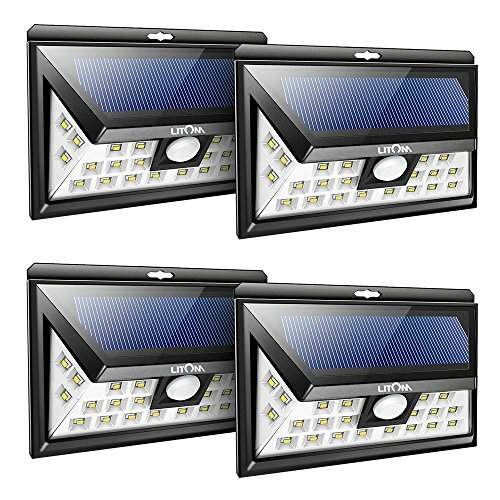 See current prices of Litom 24 LED Super Bright Motion Sensor Lights and Lampat 90 LED Solar Powered Security Lights on Amazon. 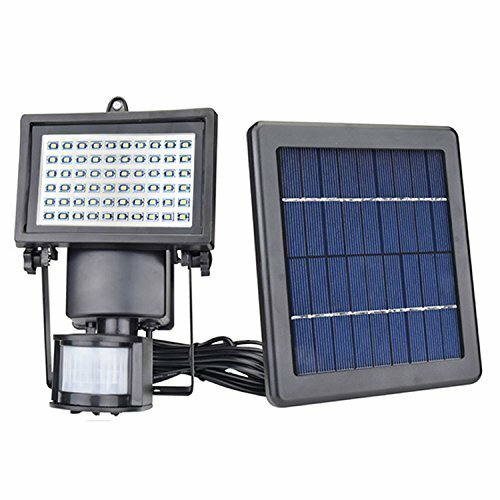 A solar lighting system with battery backup will require a 12V solar lighting system. It uses a solar panel to produce energy from the sun. The energy goes through a controller and charges a 12V deep cell battery. An LED lighting circuit or two is connected to the controller so the energy from the sun (during the day) or the energy stored in the battery (after dark), powers the light(s) at the flick of a switch. A cheap way to create a lighting system for a shed is to make it yourself. You can scrounge old LED lights or flashlights and connect the LED boards with wire. To store the electricity use an old car or boat battery; it may not start your car, but it will still hold enough of a charge for LED lights. To charge your battery, find a solar panel or two (or more) from dead garden lights. The solar panels can be connected to make a larger array and collect more solar energy to charge the battery. The old solar panel may also have a controller you can adapt to your purposes. Add a switch, and you have a lighting system for your shed. To create a solar powered shed, you should find out where the sun shines on it most, when, and for how long. Attach a solar panel or two on the roof the shed or a frame where they have the most sun exposure. Install a solar electrical panel inside your shed. The electrical panel includes the inverter, battery, and charge controller. 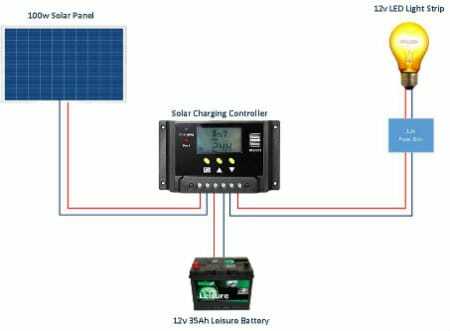 The solar panel(s) is/are connected to the inverter, which connects to the battery, which connects to the controller. There is a fuse between the battery and the inverter. Attach the LED light fixture(s) where desired, run wire back to a switch, then to the electrical panel, and connect to the controller. If everything is connected correctly, you have light! There are many ways to light up your shed. I hope that this article has helped you decide on the best plan for your shed. Whether natural or artificial, solar or electrical, there’s no excuse for burning down the shed looking for something with a match! If you found the article of use, let us know. Your questions and comments are appreciated. If you know someone who has a shed in need of illumination, please share with them.